The official TensoFlow website tensorflow.org writes: "TensorFlow™ is an open source software library for high performance numerical computation. Its flexible architecture allows easy deployment of computation across a variety of platforms (CPUs, GPUs, TPUs), and from desktops to clusters of servers to mobile and edge devices. Originally developed by researchers and engineers from the Google Brain team within Google’s AI organization, it comes with strong support for machine learning and deep learning and the flexible numerical computation core is used across many other scientific domains." TensorFlow is an open-sourse software library for machine learning across a range of tasks. It is a symbolic math library, and also used as a system for building and training neural networks to detect and decipher patterns and correlations, analogous to human learning and reasoning. It is used for both research and production at Google often replacing its closed-source predecessor, DistBelief. TensorFlow was developed by the Google Brain team for internal Google use. It was released under the Apache 2.0 open source license on 9 November 2015. TensorFlow provides a Python API as well as C++, Haskell, Java, Go and Rust APIs. A tensor can be represented as a multidimensional array of numbers. A tensor has its rank and shape, rank is its number of dimensions and shape is the size of each dimension. A graph is created in the construction phase. 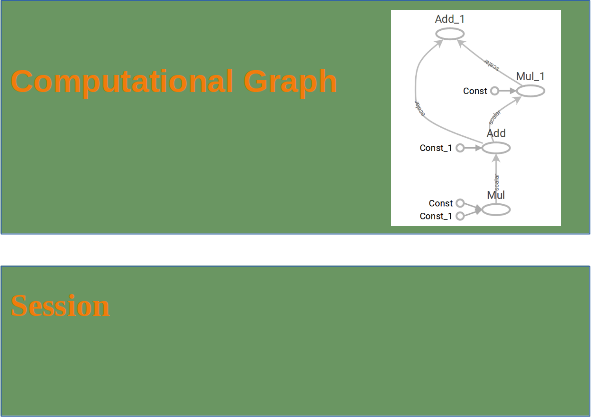 The computational graph is run in the execution phase, which is a session. A computational graph is a series of TensorFlow operations arranged into a graph of nodes. Let's build a simple computational graph. Each node takes zero or more tensors as inputs and produces a tensor as an output. Constant nodes take no input. Printing the nodes does not output a numerical value. We have defined a computational graph but no numerical evaluation has taken place! It is usually a better idea to work with the with statement, as we did in the introductory examples! We will rewrite the following program with Numpy. 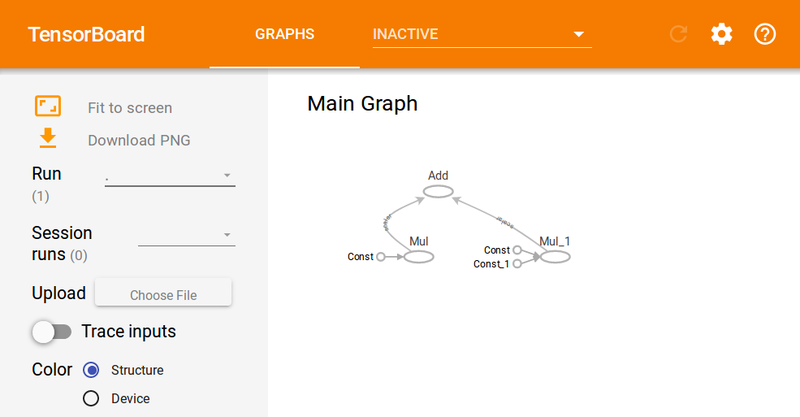 TensorFlow provides functions to debug and optimize programs with the help of a visualization tool called TensorBoard. TensorFlow creates the necessary data during its execution. The data are stored in trace files. A computational graph can be parameterized to accept external inputs, known as placeholders. The values for placeholders are provided when the graph is run in a session. Inserts a placeholder for a tensor that will be always fed. It returns a Tensor that may be used as a handle for feeding a value, but not evaluated directly. dtype: The type of elements in the tensor to be fed. shape: The shape of the tensor to be fed (optional). If the shape is not specified, you can feed a tensor of any shape. The difference between tf.Variable and tf.placeholder consists in the time when the values are passed. If you use tf.Variable, you have to provide an initial value when you declare it. With tf.placeholder you don't have to provide an initial value. A placeholder is used for feeding external data into a Tensorflow computation, i.e. from outside of the graph! If you are training a learning algorithm, a placeholder is used for feeding in your training data. This means that the training data is not part of the computational graph. The placeholder behaves similar to the Python "input" statement. On the other hand a TensorFlow variable behaves more or less like a Python variable! We will create data sets for a larger example for the GradientDescentOptimizer. # For the test data, hold the entire dataset in one constant node. # Run all the initializers to prepare the trainable parameters. # to a K-dimensional vector σ(z) of real values in the range [0, 1] that add up to 1.